There are a few points that FHQ left undiscussed -- or perhaps unclear -- when the RNC finalized their delegate selection rules on timing and allocation back at their winter meeting this past January. That was mostly by design, waiting for the clock to run out on when the party could actually make any further changes. We're still not there yet, but there are no meetings of the RNC scheduled between now and September 30 -- the deadline beyond which changes can no longer be made (see Rule 12). 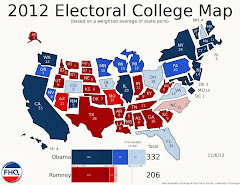 With the rules governing the 2016 presidential nominations now in place at the national party level, FHQ can focus a bit more on the changes made to the rules relative to 2012. Since the DNC did little to alter their delegate selection rules from 2012, most of this will be directed at the Republican side. The biggest thing here is to highlight the fact that the RNC had one set of rules coming out of the Tampa convention in 2012 and has altered them in the time since. Importantly, that meant changes to the combination of rules and penalties associated with the timing of delegate selection events and the method of allocating those delegates. The rules that emerged from the Tampa convention sought to remedy the problem with the 2012 rules: there were two possible violations (timing and allocation), but only one penalty. That meant that there was only one 50% reduction in a state delegation for rogue states like Florida and Arizona which not only went to early but also maintained winner-take-all allocation methods despite holding contests in the party-designated proportionality window. The RNC had one penalty, but no contingency in place for the possibility of a state violating both the timing and allocation rules. And the party did not have the ability to double penalize the states; assessing the 50% penalty twice. The Tampa rules dealt with that, but inconsistently and ineffectively. The party added a super penalty to dissuade states from violating the timing rule and shifted the 50% penalty to allocation violations. The problem with the former was that the rule forbidding early contests (Rule 16) did not match the penalty for violating that rule (Rule 17). Rule 16 forbade contests other than Iowa, New Hampshire, Nevada and South Carolina from holding primaries or caucuses before March 1. However, Rule 17 levied a penalty against states that would hold contests prior to the last Tuesday in February. In 2016, that difference in the calendar was a week. There was, therefore, a week in which states could hold contests and not be sanctioned by the party. That was a problem. And one the RNC recognized. That was the state of affairs heading into 2014. The RNC had a set of flawed delegate selection rules that it had to tweak in some way to more efficiently/effectively/ideally deter timing or allocation rules violations. The party maintained the super penalty and strengthened it to address one of the remaining issues on the timing front.1 The party also synchronized the rules and penalties for timing, squaring the March 1/last Tuesday in February loophole. The rule was a bit too specifically narrow in its first iteration. It and the penalties were tailored to hit the usual rogue suspects: Arizona, Florida and Michigan. This plan proved to perhaps be too clever by half. In the process of amending the timing rules and penalties, the RNC also tweaked and simplified the allocation rules and penalties at their winter meeting last January. The changes were twofold. First, the proportionality window was squeezed into a smaller period. Instead of states with contests before April 1 having to have some element of their delegate allocation plan be proportional, that only applies to states with contests before March 15. Secondly, the applicability of the penalty was changed. The RNC tightening up the super penalty meant that the 50% penalty was no long necessary as a backstop against states willing to go too early and maintain a true winner-take-all method of allocation. All that means is that the RNC laid out two distinct penalties; one for a timing violation and one deterring winner-take-all contests prior to March 15. Closing the last Tuesday in February/March 1 loophole cleaned that up. That left a super penalty for states willing and able to go rogue and a 50% penalty for pre-March 15 states that fail to include a proportional element to their allocation plans. Additionally, under the altered plan, states that do not comply with the proportionality requirement would have their delegates allocated to candidates proportionally automatically by the RNC at the convention. 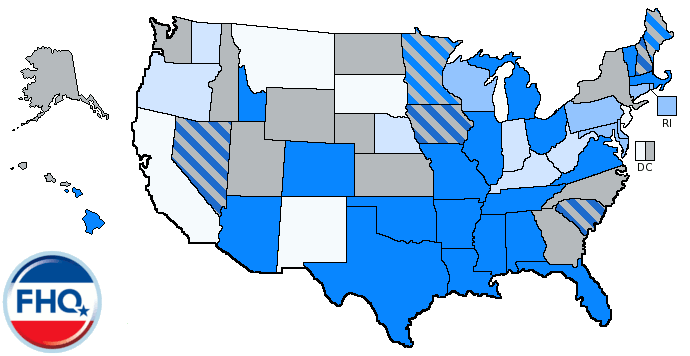 States with no proportional element to their allocation plans (and with contests before March 15) would have their at-large (statewide) delegates proportionally allocated to all candidates who received at least 10% of the vote in the primary or caucus.3 This automatic proportionalization would be in addition to the 50% penalty. Together, both penalties would seemingly and more effectively deter states from utilizing a true winner-take-all plan before March 15. No, the 50% penalty has proven less than effective as a one-off penalty over the 2008 and 2012 cycles. However, there is little to gain by stubbornly sticking to a winner-take-all allocation method if the RNC is just going to add an element of proportionality at the convention anyway. The bottom line is that the RNC has synced it rules and penalties and has from all appearances closed any remaining loopholes in the party's delegate selection rules. States that violate the timing rule are assessed the super penalty and states that break the allocation rules are assessed a 50% penalty and automatically proportionalized by the RNC.4 The DNC rules are different. The Democrats require proportionality of all states regardless of when they hold their delegate selection events and levy a 50% delegate deduction on any state that holds a contest before the first Tuesday in March (March 1 in 2016). The trump card they can play if that 50% penalty proves an ineffective deterrent is that the DNC Rules and Bylaws Committee can increase the penalty at their discretion. 1 The original super penalty treated states both differently and the same. The bigger the state, the larger the hit to the delegation. However, all states got knocked down to 12 total delegates. That meant that if a state was small enough -- or had a small enough delegation -- that the penalty ended up being less than the 50% penalty that has traditionally existed. The point of the super penalty was to be, well, super. The fix the RNC devised was to set a threshold at 30 total delegates. States with 30 or more delegates would be penalized down to 12 total delegates for a timing violation while those states with fewer than 30 delegates would have just nine left over after the penalty was assessed. 2 To reiterate, both Arizona and Florida were double violators in 2012, breaking both the timing and allocation rules. There were some issues with the Michigan allocation method that would potentially brought it under the winner-take-all regime. The RNC, then, hoped these states would be deterred by the super penalty, but not by a 50% penalty. Again, those states would have been incentivized to go early, but not too early. It would not be early enough to fundamentally disrupt the calendar. 3 One of the lessons of 2012 Republican delegate allocation rules that never seemed to sink in very well was what the true definition of "proportional" was and what that meant for allocation. Note that FHQ keeps using variations of the phrase "and element of the allocation plan has to be proportional". That is by design. States like New Hampshire can still maintain a strictly proportional allocation under the 2016 RNC rules, but that is not mandated. All states are required to do by the rules -- the bare minimum proportionality -- is to allocate their cache of at-large (statewide) delegates proportionally. That is a number of delegates that varies by state based on how loyally Republican a state has been in past votes for president, governor and overall state legislature control. The redder a state is, then, the more at-large delegates it receives. Ohio for instance is similar in (population) size but bigger than Georgia, yet the Peach state had more delegates in 2012 than did Republicans in the Buckeye state. 4 No, proportionalized is not a word. I'm making it up. Get in on the ground floor now and start using it. With Arizona moving its presidential primary back and back into compliance with the national party rules, there is one less threat to the ideal primary calendars under which the DNC and RNC would like to operate. FHQ spent a great deal of time in 2011 talking about a couple of factors. One was the fact that Arizona, Florida and Michigan (among others) should never have been surprises to anyone. 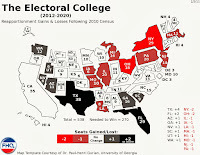 After 2008 but before 2012 none of those states made legislative moves that changed anything about the threats they represented to the 2012 presidential primary calendar. The other was that, after 2008, there were around 20 states that had to change state laws (or party bylaws) to comply with the parties' desire for a later start (read: February) to primary season. Most of those states complied. Some even shifted to dates later than the earliest date the national parties allowed non-carve-out states to hold their delegate selection events (March 6 in 2012). Arizona, Florida, Michigan and a handful of other states did not. That meant that there was work to do from the national parties' perspective ahead of the 2016 cycle. Florida moved back from the brink in 2013 and Arizona and Missouri have already done so in 2014, inching the calendar closer to the national parties' ideal point. However, there is still some more inching to do as we begin the slow march toward 2015, when many of these decisions will be made (or not made) at the state legislative level. Michigan is still a problem and North Carolina became one in 2013. And who knows which state may represent the next Utah and add to the threats? It may be Utah. Now that the national parties have set their rules the baton passes to the states. It is their point in the sequential process to decided to move back and comply, stand pat in compliance or defiance or move up and defy the those national party delegate selection rules. Things are far from clear with a lot left to be decided in 2015, but for now, at this brief moment in time, the national parties are in good shape and seemingly headed in the direction of a later start to primary season. Of course there is a long way to go before the calendar is set for 2016. And the next move is the states, no the national parties. The 2016 presidential primary calendar can also always be found at its permanent home here. As was the case with the maps from past cycles, the earlier a contest is scheduled in 2012, the darker the color in which the state is shaded. Michigan, for instance, is a much deeper shade of blue in February than California is in June. There are, however, some differences between the earlier maps and the one that appears above. 4 The Western States Presidential Primary in Utah is scheduled for the first Tuesday in February, but the contest will only be held on that date if the state legislature decides to allocate funds for the primary. If (and only if) there is no Western States Presidential Primary (i.e. : the legislature does not fund the February contest) will the fourth Tuesday in June primary for other offices be an option available to the Utah parties according to the state law. 9 The North Carolina primary is now scheduled for the Tuesday following the South Carolina primary if the South Carolina contest is prior to March 15. Given the protected status South Carolina enjoys with the national parties, a primary prior to March 15 is a certainty for both parties in the Palmetto state. The link to the North Carolina statute does not yet reflect the change made to the presidential primary law. Language laying out the parameters for the primary can be found in the bill (HB 589) signed into law last summer. FHQ is still trying to figure out how and/or why,1 but Arizona's presidential primary calendar move slipped under our radar back in March and April when the change happened. John Cavanaugh (R-23rd, Fountain Hills) introduced legislation in the state House charging the Arizona secretary of state with creating an online system for signing nomination petitions among other things. The bill was introduced in late January about two weeks into the 2014 state legislative session. Other than an section ordering issue within the bill, the legislation was not amended in any way in the House. It passed unanimously almost a month after its introduction on February 24. The bill was transmitted to the state Senate one day later. 16-241. Presidential preference election; conduct of election: A. A presidential preference election shall be held on the fourth Tuesday in February IMMEDIATELY FOLLOWING MARCH 15 of each year in which the President of the United States is elected to give qualified electors the opportunity to express their preference for the presidential candidate of the political party indicated as their preference by the record of their registration. No other election may appear on the same ballot as the presidential preference election. The Senate Rules Committee concurred on March 10, clearing the path for the bill to be considered on the Senate floor. The Senate Committee of the Whole passed the bill -- do pass as amended -- on April 8. That procedural vote cleared the way for the Senate to finally pass the bill -- with just two dissenting votes -- a day later on April 9. Governor Jan Brewer (R) signed the bill into law a week later on April 16, moving the Arizona presidential primary back. Importantly, the shift brings Arizona back into compliance with the national party delegate selection rules. Any contest on or after March 1 means a state avoids sanction in 2016. Arizona was docked half its delegation in 2012 by the Republican National Committee for holding a delegate selection event prior to the first Tuesday in March. To drive the point home, it is worth noting that Arizona was among the limited number of rogue states that disrupted the Republican calendar in 2012. It won't be from the looks of it in 2016. Also, it should be said that the chairman of the RNC Rules Committee is Arizona Republican National Committeeman, Bruce Ash. That may say something about the specificity of the bill. The language in the changes to the Arizona statute go to some length in protecting the traditional Arizona delegate selection process. March 15 is the earliest date on which a state can hold a delegate selection event and allocate delegates in a winner-take-all fashion according to the amended Rules of the Republican Party. The move allows Arizona to continue allocating delegates winner-take-all. It is not clear to FHQ what the intended date -- based on the legislation -- of the 2016 Arizona presidential primary originally was/is to be. The statute now places the contest on the Tuesday "immediately following March 15" -- moving it from the last Tuesday in February. That is language that is less problematic in years in which March 15 is not on a Tuesday as it is in 2016. The new statute seems to indicate that the primary will be in March 22, 2016. My point is that the language eliminates March 15 as a date on which the primary can occur when a March 15 date would be compliant with the RNC restrictions on winner-take-all allocation. The one factor that may have motivated a March 22 date over a March date for the primary is that the former is a date currently unoccupied on the 2016 calendar. The latter, on the other hand, already has a subregional Missouri/Illinois primary scheduled and may be a landing place for a number of states wanting early dates but also winner-take-all allocation. Of course, March 22 may prove inviting to other states as well. Finally, the new law also alters the power given the Arizona governor to change the date of the presidential primary. 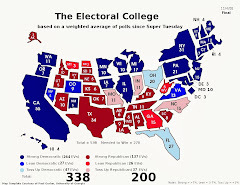 In both 2004 and 2008, then Arizona governor, Janet Napolitano (D) used her proclamation power to move the presidential primary from the fourth Tuesday in February to the first Tuesday in February; then compliant with national party rules governing delegate selection. In 2012, Governor Jan Brewer (R) threatened to shift the date up -- in further defiance of the national party rules -- but used that threat as leverage to get the RNC to sanction a presidential primary debate in Arizona. Governor Brewer eventually opted not to issue a proclamation, keeping the Arizona primary on the last Tuesday in February but still noncompliant with the national parties' rules. The new law strips out the governor's ability to move the contest to an earlier date. However, the governor retains the power to move the primary to a later date than the one specified (and discussed) above. Changes could still occur during the 2015 state legislative session that makes Arizona a threat to the calendar. For the time being, though, Arizona is no longer a rogue state. 1 Every state has a different name it seems for its presidential primary. Some call it presidential primary in the existing statute while others call it a presidential preference primary or a presidential preferential primary. Arizona is unique in calling their contest for allocating national convention delegates to presidential candidates a "presidential preference election". It seems like a minor point, but these subtle differences can make it difficult sometimes to track the comings and goings of primary calendar movement. This is one of those times. H/T: Emily Schultheis for bringing this to my attention. The Democratic National Committee has kicked off its summer meeting in Atlanta. The party will meet over the weekend to hear and vote on the draft proposal for its 2016 delegate selection rules from the Rules and Bylaws Committee. As FHQ mentioned following the spring meeting when changes to the rules were discussed, there is little in the way of substantive change to 2016 (as compared to the 2012 rules). 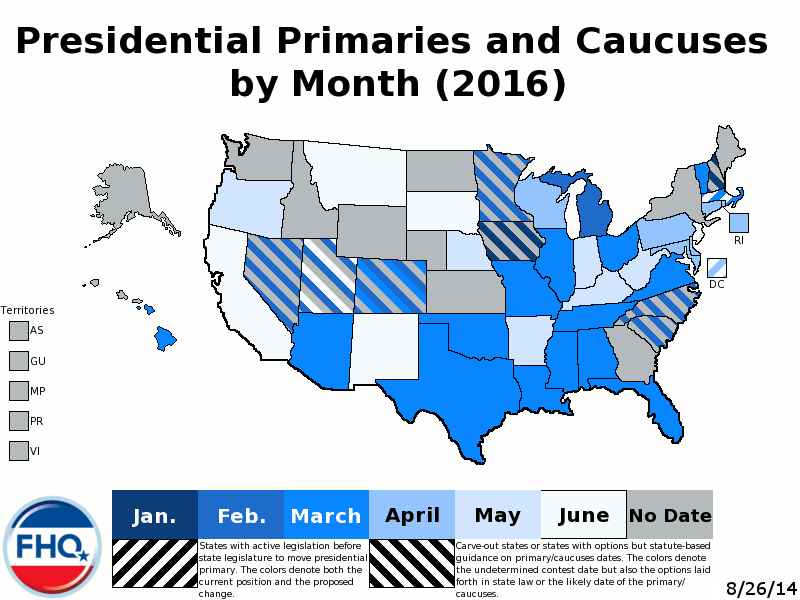 That continues to be the big take home along with the fact that the proposed (ideal) calendar of primaries and caucuses is largely in line with that of the RNC. The underlying rules are slightly different across parties, but the intent is the same: keep contests out of January, make February about Iowa, New Hampshire, Nevada and South Carolina, and let every other state opt for a position thereafter. The DNC vote will close the door on national party rules tinkering for the 2016 cycle. The RNC is not set to meet again before its deadline -- for finalizing its rules -- at the end of September. That will clear the way for states to react and adapt to the changes during 2015.